MyLanViewer network scanner / IP scanner is a powerful NetBIOS and IP scanner, whois and trace route tool, remote shutdown and Wake-On-Lan manager, LAN messenger and network monitor. Portable MyLanViewer Network Scanner displays your network computers in an easy to read, buddy-list style window that provides the machine names, MAC addresses, shared resources and other technical details for each computer. IP scanner, NetBIOS scanner, network scanner and LAN messenger. 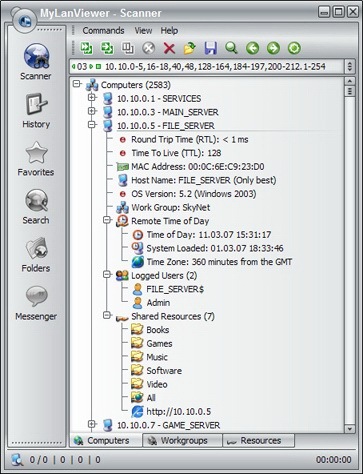 ...... computer name, IP address, MAC address, NIC vendor, OS version, logged users, shared folders and other technical details for each computer. Portable MyLanViewer Network Scanner supports remote shutdown, wake-on-lan, lock workstation, log off, sleep, hibernate, reboot and power off. It is able to monitor IP address and show notifications when the states of some computers change. Portable MyLanViewer Network Scanner can also view and access shared folders, terminate user sessions, disable shared folders, show netstat information and detect rogue DHCP servers. Portable MyLanViewer Network Scanner can monitor all devices (even hidden) on your subnet, and show notifications when the new devices will be found (for example, to know who is connected to your WiFi router or wireless network). Portable MyLanViewer Network Scanner easy to install and use, and has a user-friendly and beautiful interface. Qweas is providing links to Portable MyLanViewer Network Scanner 4.13.0 as a courtesy, and makes no representations regarding Portable MyLanViewer Network Scanner or any other applications or any information related thereto. Any questions, complaints or claims regarding this application Portable MyLanViewer Network Scanner 4.13.0 must be directed to the appropriate software vendor. You may click the publisher link of Portable MyLanViewer Network Scanner on the top of this page to get more details about the vendor.